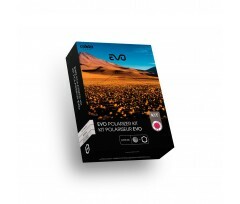 EVO represents the ultimate evolution of the internationally acclaimed CREATIVE filter holders, created by Cokin over 30 years ago. 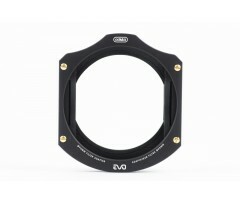 The new EVO filter holders were designed based on Cokin’s unrivaled expertise in filter making. 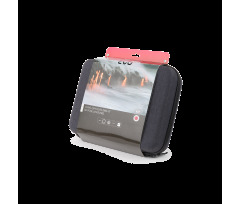 The introduction of very high density filters such as Cokin’s NUANCES ND1024 roused interest in long exposure photography, which involves important physical contraints. 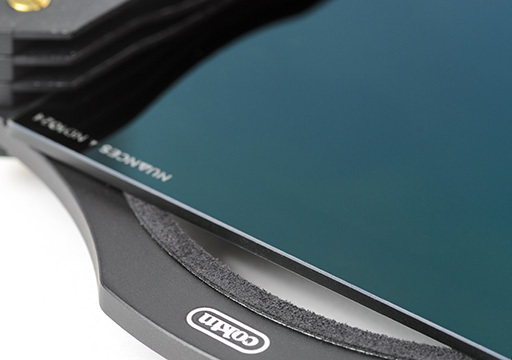 While the exposure lasts, wether it is for several seconds, minutes or even hours, the neutral density filter should be placed in a completely light-tight filter holder system. Otherwise, any light beam coming between the filter and the filter holder structure can reverberate on the front lens and generate ghost images, flare or loss of contrast. 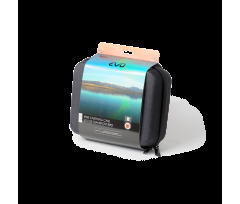 The EVO filter holder line solves the problem by using a non-abrasive foam that blocks light and keeps physical contact between the filter and the filter holder. The foam is mounted on the filter holders to limit mechanical friction and wear, unlike other systems with protective foam placed on the filters themselves, which are no longer efficient once the foam is worn out. 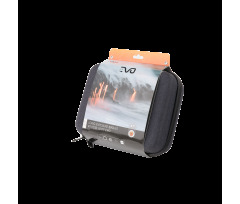 The EVO filter holder plates are built in aluminium and filter inserts are made of durable polyamide. 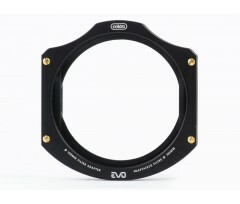 The EVO system supports most Cokin CREATIVE adapter rings : 49 to 62mm in size M systems, 52 to 95mm in size L systems, 62 to 112mm in size XL systems. 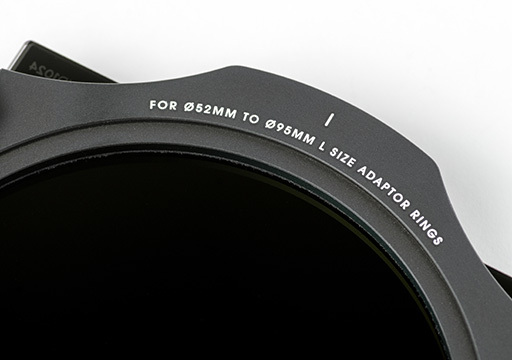 Existing CREATIVE system users can therefore re-use their current adapter rings. 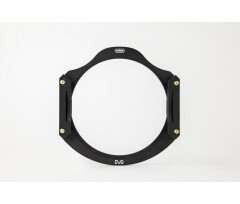 The EVO filter holder comes with a detachable plate on which you can mount a screw-on circular polarizing filter, 95mm in diameter for size M systems, 105mm for size L systems and 127mm for size XL systems. 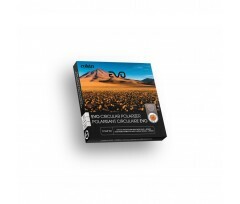 The circular polarizing filter creates spectacular effects that cannot be reproduced digitally. 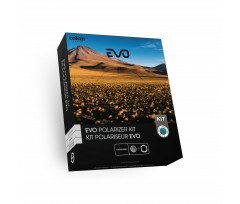 The modular EVO system lets you use up to 3 filters together for wider possibilities. In this configuration you can use up to three square or rectangular filters together. A foam mask prevents light leaks between the filter and the filter‑holder. 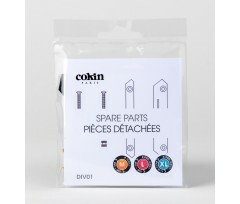 You can reduce the thickness of the filter‑holder by taking the four nuts off the screws, and removing one or even two pairs of filter slots. This interesting trick can help you fix vignetting issues when using a wide-angle or ultra-wide-angle lens. Here, standard configuration filter slot #3 is replaced with the front plate for circular filter. On this plate, you can screw the Cokin EVO C-PL filter in diameter 95mm (EVO M), diameter 105mm (EVO L), or diameter 127mm (EVO XL). 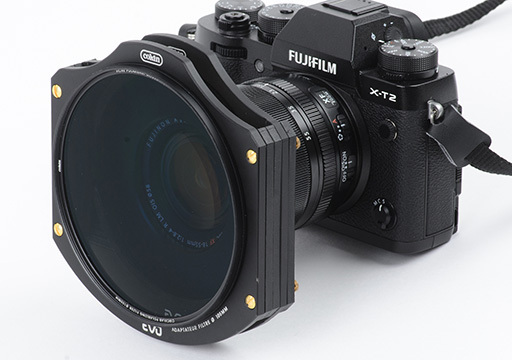 In this configuration, the filter‑holder can hold up to two square or rectangular filters and the Cokin EVO C-PL filter.